Power Out? 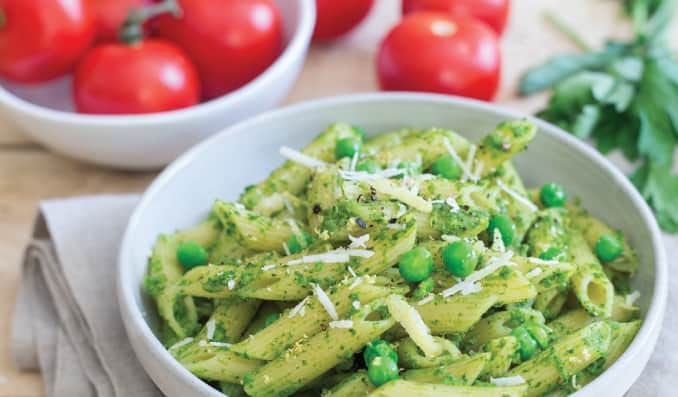 Pestle and Mortar on with this Springtime Pesto Recipe! Has the windy weather left you considering the ideal meal for a candlelight dinner? If so, we have a super simple recipe that’s tasty and full of nutritious foods we love: organic arugula, garlic, and lemon, plus it makes use of our incredibly high quality whole wheat organic penne pasta. Serves 4-6. Prep time: 25 minutes. Process the arugula, parsley, garlic, Parmesan and peas in a food processor until they form a smooth paste, stopping to scrape down the sides of the bowl twice. Add the lemon juice, salt and olive oil and process, scraping down as needed, to make a smooth, creamy pesto. Place the pesto in a bowl, and stir in the lemon zest. Cook the pasta according to package directions; drain and toss with the pesto. Serve with additional Parmesan cheese, and freshly-ground black pepper to taste. Spread this light, fresh pesto on a prepared pizza crust and top with goat cheese before baking or broiling, and cut in small triangles for a seasonal appetizer. Add halved cherry tomatoes and snips of fresh herbs or garlic scapes if you like. The nutritional values and information provided are approximation. Posted by permission from StrongerTogether.coop. Find more recipes and information about your food and where it comes from at www.strongertogether.coop.